Just hanging out on a bench with my face on it in my leotard. Now, if you are even slightly familiar with Marvel’s She-Hulk, you’re more than likely to imagine the impressive muscle bound green form in her signature leotard, posing with her hip cocked to the side. If you are familiar with the powerhouse lawyer known for being an amazingly strong willed and non talked about feminist icon, then there is no need to educate you on the complex birth and development of this character. Marvel has a thing for New York attorneys secretly being heroes, I see. Now for the part that’s more in depth, like the origins and history. She-Hulk’s birth and development stemmed from the popularity of Lou Ferrigno’s role in The Incredible Hulk T.V series and their fear that it would receive the same treatment as the Six Million Dollar Man and its “spin off,” The Bionic Woman. You see, depending on what information source you follow, Marvel had big fears of the T.V executives taking the character and gender bending him, cutting Marvel out of profits if it does well OR upsetting long time fans. Marvel had the legend himself and Stan Lee co-created The Savage She-Hulk. 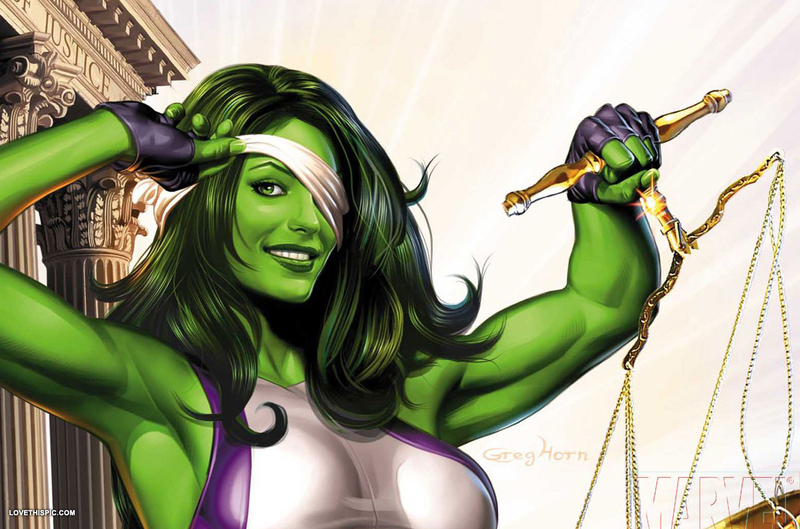 Lawyer Jennifer Walters is injured in an attack by gangsters and the only person able to donate blood is her cousin, Bruce Banner (The Incredible Hulk), thus giving birth to She-Hulk. After a short solo comic run she eventually wound up being reserved to guest and cameo appearances in other comics due to her creator’s confusion of what to do with her. Her solo series matched her up against more and more backroom villains of the Marvel universe. Oh no, it’s the Man Elephant? All of that should be expected as the character was something new. You see, She-Hulk differed greatly from other female comic book characters because she had power and no, I am not saying that females before her didn’t have powers, but their powers were corrupted. Female characters on her level were reserved to being evil or easily swayed into a frantic misuse of their powers. 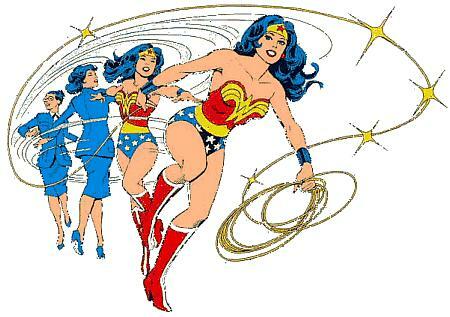 While Wonder Woman came first and had none of the qualms of being a powerful woman among men, she never gave into any of the power plagues of her other female counterparts in comics. She was designed that way by the feminist academics who created her. Although her powers came from the much more rampant and destructive Hulk, she went away from her cousin’s alter ego signature rage, learning to control her powers. 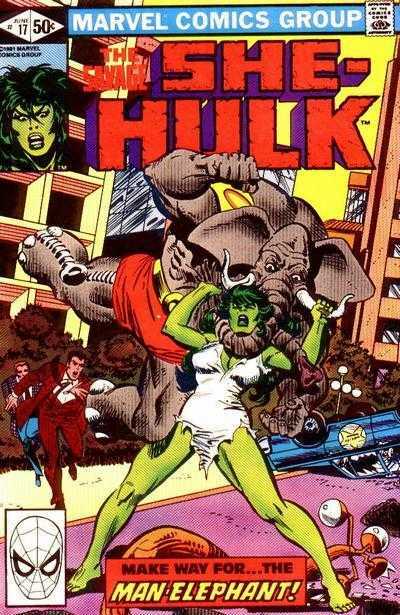 Indeed, a woman tamed the Hulk’s (albeit not as powerful) rage and fury. She is able to transform back and forth. There was no man who taught her the correct way to use her strength. She wasn’t convinced by the power of love or any other trope. She-Hulk has more or less always been her own woman. An accidental feminist icon created in the efforts to keep a company’s profits close but instead, taught that female characters can be all there own. 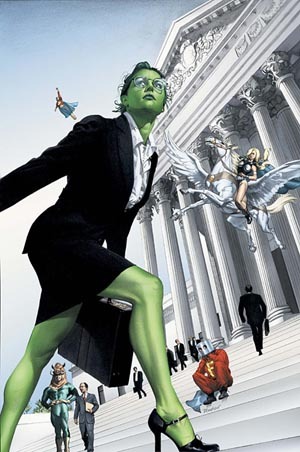 That became more apparent with the her return solo series,The Sensational She-Hulk, where she lampooned and parodied the very tropes and accusations Mr. Goyer accused her of. Between arguing with the comic writers and talking directly to the reader, she stood her ground. Marvel accidentally created a feminist icon we should be discussing a lot more.